There are a number of different causes of dry eye. At Collins Street Optometrists we place a strong emphasis on properly diagnosing why dry eye has developed. Depending on your circumstances, the starting point for investigating your dry eye issues is often to undergo an initial consultation, after which you may be booked in for a subsequent comprehensive dry eye assessment on another day. Sometimes we may try to address your dry eye issues first before reviewing your general eye health at a later date. In performing a comprehensive dry eye assessment, one of the most important tasks is to determine whether the dry eye case is aqueous-deficient (due to low tear volume) or evaporative (due to poor quality tear film), a combination of both, or some other factor such as incomplete blinking. We then investigate further to establish the cause of the low tear volume and/or the poor quality of the tear film. We rely on several key tests to do this; all but the first and last of these procedures are performed on the Oculus K5 keratograph. Once these procedures have been completed we are able to provide a diagnosis and explanation of the nature and severity of your dry eye condition. 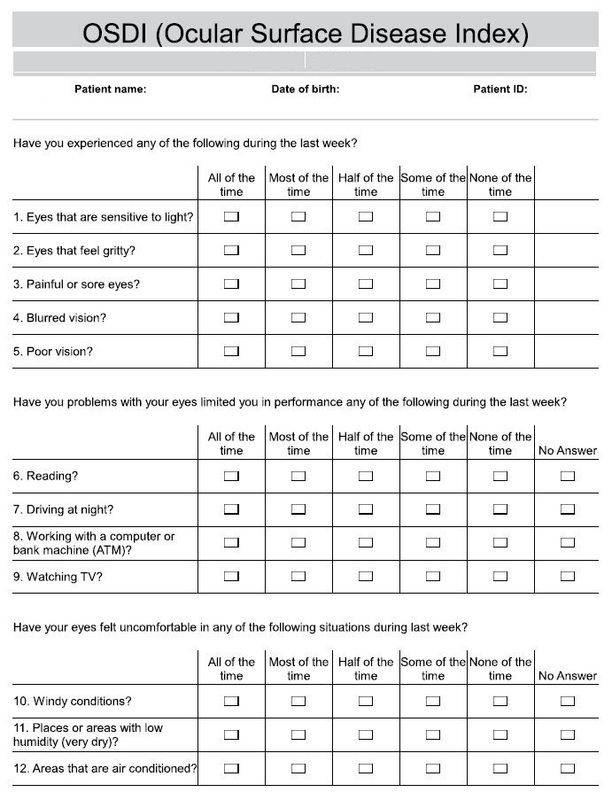 The Ocular Surface Disease Index (OSDI) is a 12-item questionnaire designed to assess symptoms of ocular irritation consistent with dry eye disease and their impact on vision-related functioning. It provides us with a starting point for assessing the impact dry eye disease may be having on you. Click here to download the OSDI questionnaire. 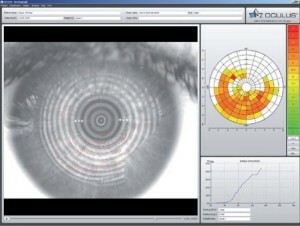 Measuring tear volume is a critical part of the dry eye assessment. 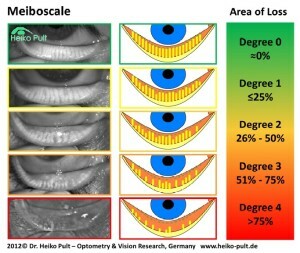 At Collins Street Optometrists we measure your tear volume by looking at the height of your tear meniscus. which rests on your lower eyelids. Anything less than 0.2mm is considered to represent a volume deficiency. A touch free, fully automated illumination and non-glare method is used to measure the height of the tear meniscus. This is important to avoid reflex tearing such as that associated with discomfort, heat and glare. 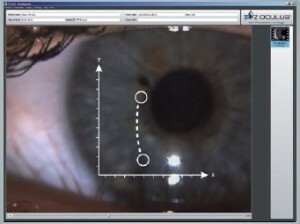 We will use this method to quantify your tear volume and define its characteristics along the lower lid margin. Frequently we find patients with symptoms of dry eye using drops when tear volume measurement shows they produce enough tears of their own. If anything using these drops just makes their eyes more watery.Should your tear volume be an issue we will consider factors such as whether you have an associated systemic condition, or are taking systemic medications that may cause this. If necessary we will write to your health care practitioner on your behalf explaining the problem. If there are no other associated issues with your tear film, we may insert a punctal plug to block your drainage and allow your natural tears to remain in contact with your eyes for longer. The tear film coats the front surface of the cornea, and the integrity of the cornea depends heavily on the quality of this tear film. 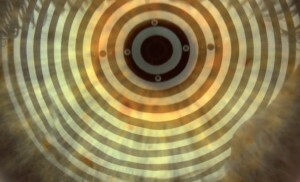 Each time you blink you re-coat the corneal surface with a fresh tear film. At Collins Street Optometrists, tear break up time is measured with touch free, fully automated infrared illumination that produces no glare or reflex tearing. Ideally the tear film should last until the next blink when a new tear film coats the cornea. In other words your tear break up time (TBUT) needs to be longer than the time between blinks. As a guide, TBUT should normally be at least 10-12 seconds; anything less may indicate unsatisfactory tear film quality. 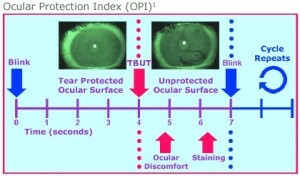 When TBUT is less than the blink rate, the ocular surface is left unprotected. Signs and symptoms of dry eye are exacerbated under these circumstances. If your TBUT is a second less than your blink interval, you will feel discomfort. If your TBUT is regularly two seconds less than your blink interval, your front corneal surface is at more serious risk. 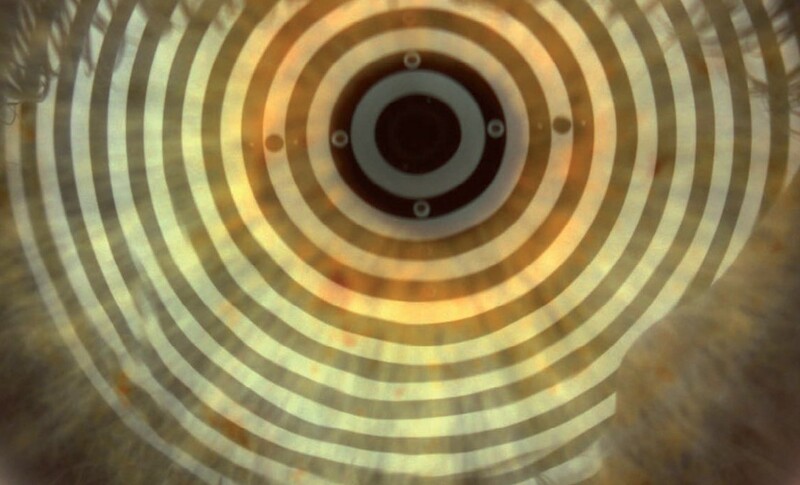 Evaluation of the lipid layer thickness is essential in managing dry eye because TBUT relies heavily on how much lipid (a type of fat) is in the tear film. If the lipid layer is too thin or absent, the tears will evaporate quickly, resulting in tear film instability and lower tear break up time. In assessing the lipid layer ideally we see consistent and colourful rainbows - these indicate that the tears have a rich fatty composition.Absence of good quality lipids in the tear film may indicate underlying meibomian gland disease. This is treated by some or all of supplements, meibomian gland scrape, gland expression and relevant eye drops. 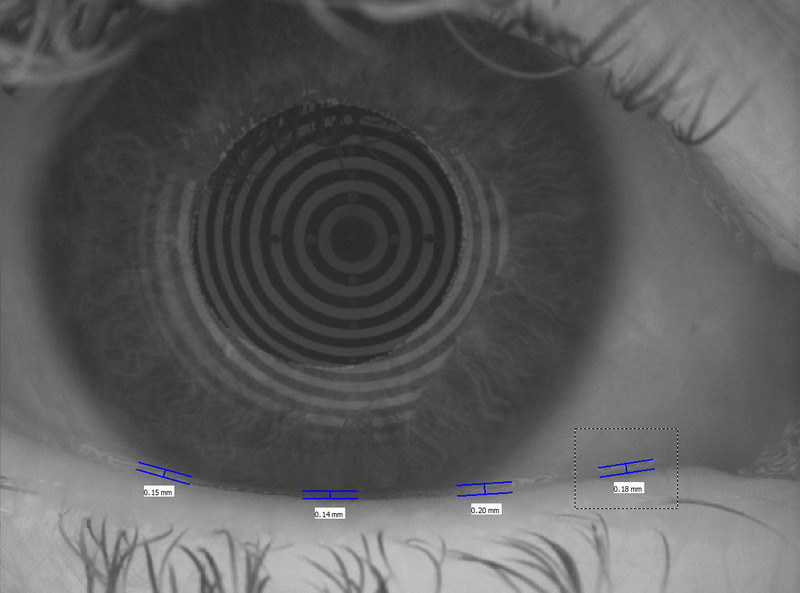 By recording a video of your tear film movement inbetween blinks, we can observe the tear film particle flow characteristics and the viscosity of the tear film. Highly viscous tears may indicate inflammation, lack of volume, and poor quality tear film. We take this into consideration when managing your signs and symptoms. The conjunctiva is a clear membrane that covers the sclera, the white part of the front of the eye. Small blood vessels run through the conjunctiva; the more blood that is flowing through these vessels, the redder the eye appears. Excessive redness is often a sign of inflammation such as that occurring in dry eye disease. Meibography provides an enhanced view of the meibomian glands; these produce the important lipid layer at the front of the tear film. At Collins Street Optometrists we use the most advanced form of infrared imaging available to check your meibomian gland morphology and density. Meibomian gland dysfunction is the most common cause of dry eye, and can usually be treated - provided treatment starts early enough. Meibography shows where meibomian glands are blocked and/or have stopped functioning completely. It is possible to unblock meibomian glands and restore normal gland health and function, but left untreated these blockages can eventually lead to irreversible meibomian gland drop-out. It is therefore important to treat meibomian gland disease promptly. We use specific dyes to detect and highlight any diseased corneal and conjunctival epithelial cells. These dyes have the ability to penetrate the walls of compromised surface cells that are dessicated or dying. The two dyes, flourescein and lissamine green, are relatively comfortable in the eye and help us grade the extent of ocular surface disease. Lissamine green tends to be more useful for revealing changes to the conjunctiva, whereas fluorescein is more usually used to stain the cornea. Outlining which treatment options are most appropriate for your clinical presentation and explaining the likely costs of each option. Typically a comprehensive dry eye assessment takes about an hour and is performed separately from the initial eye examination. Where it is diagnosed that your dry eye disease is due to anterior blepharitis and/or aqueous insufficiency, treatment may also be initiated at the dry eye assessment visit. If meibomian gland dysfunction is the main cause of your dry eye disease, usually treatment will be arranged at a subsequent visit. The consultation fee for the dry eye assessment is $92.25, which in most circumstances will attract a Medicare rebate (provided it is not performed on the same day as the initial consultation). The fee for performing the keratographic procedures is $138.85, which includes all keratograph reviews within three months of the original dry eye assessment. There is no Medicare rebate for keratography.